Something of the same can be said about our perception of the feasts of the Church – our perception of time and the reality of the Kingdom are not at all the same thing. The tendency within our lives is to reduce the feasts of the Church to mere celebrations – days we decide are special and that we treat in a special way. Thus, nothing about the day is, in fact, different. “Reality” is only found in the make-believe of the liturgical game we all play. The celebration of Pascha, for example, is not a mere annual remembrance of the events of that day (on which Jesus rose from the dead) – it is, instead, by the grace and condescension of God, a true participation in the event itself. This is not because the time itself is special or even significant – nor is it because we ourselves are thinking in special ways. The liturgical and spiritual reality of holy events are a gift from God – a condescension to us – not unlike the condescension of His incarnation. God gives Himself to us in our worship of Him. This is the very heart of worship. 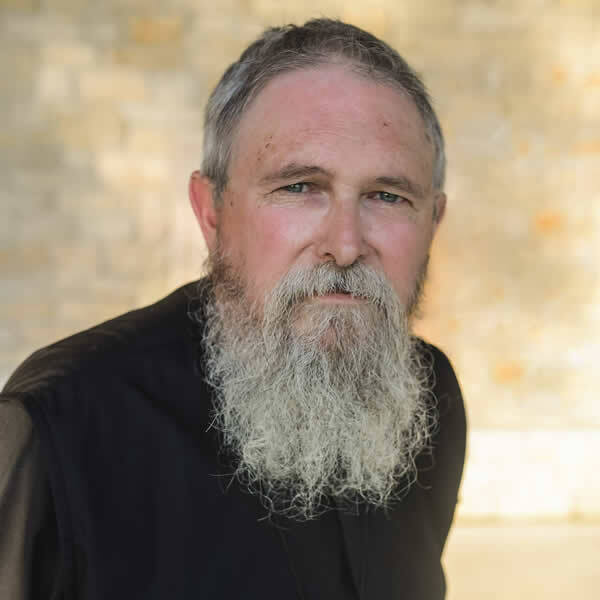 As Archimandrite Zacharias of St. John’s in Essex notes: “The heart of worship is an exchange.” The exchange that takes place in our worship of God is that we offer ourselves and all that we have (including our sin) and receive in return the very Life of God. “Thine own of Thine own, we offer unto Thee, on behalf of all and for all.” This mutual participation in the life of God and man is also the very content of our salvation. God becomes what we are, that we might become what He is. In our liturgical life, this reality is also expressed in the exchange of time. We offer to God what we have (the time we give in our worship) and this time is exchanged: God gives us the eternity of His Pascha. Thus we do not merely remember Pascha, we participate in Pascha. Christ “tramples down death by death and upon those in the tombs bestows life,” and in our liturgy He tramples our death by His death and grants us lives in the hopelessness of the tombs we have created for ourselves. I have stood at the historical places of Holy Week: I have touched the rock of Golgotha and knelt and prayed; I have knelt within the tomb of the risen Christ as a priest beside me prepared the bread for the Eucharist; I have kissed the rock upon which His lifeless body was laid and prepared for its burial. These and many other things were the content of a pilgrimage to the Holy Land in which I participated several years back. Those places, locked within the geography of the earth, had their share in the events which took place within and upon them. Their veneration was worthy and deeply moving. But none of them can compare to the reality of the exchange and the Pascha that occurs within the worship of the Divine Liturgy. It is a misunderstanding of place and time that leads us to value the linear – the place and time – over the transcendant – which makes this place and time to be united with that place and time – and makes us to be united with Him. Thus every Christian makes pilgrimage to the Holy Land and to the tomb of the Crucified and Risen Christ as he approaches the Holy Mysteries in faith and love. God grant us a good Holy Week and good Pascha. Let us not deny or despise the exchange that awaits us. 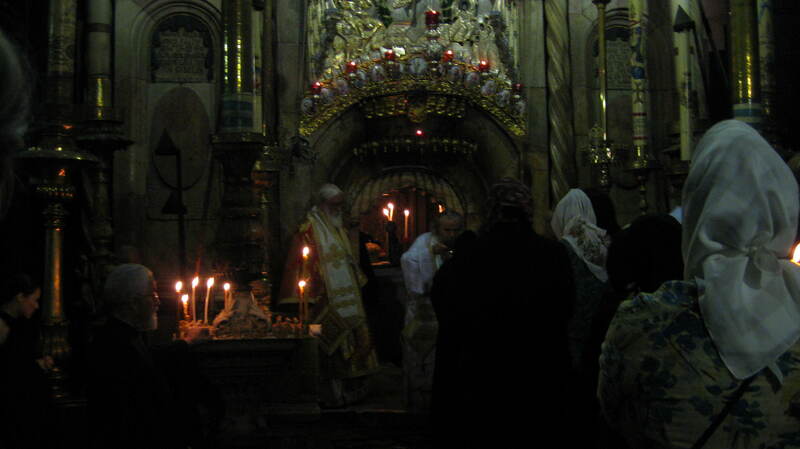 Near daybreak, pilgrims draw near to the tomb of Christ to receive communion. The bishop pictured who is communing the faithful is Met. Kallistos Ware. I apologize for my poor photography. “nor is it because we ourselves are thinking in special ways” – yes, thank you! Thank you, Fr. Stephen! I needed these words that you wrote! “It is a misunderstanding of place and time that leads us to value the linear – the place and time – over the transcendant – which makes this place and time to be united with that place and time – and makes us to be united with Him. As I’m surrounded by the sounds (radio programming) and sights (local Church advertisement of their Good Friday and Easter programs) that make much of the linear historical reality, this is a good succinct clarification. Thank you, Father. As an aside (and as you have pointed out before), I suspect that Evangelicals focus so strongly on the reality of the past linear events (at the expense of the present spiritual reality) at least in part in reaction to the Liberal abandonment of the biblical affirmation of the same in favor of “spiritualized” explanations of biblical teaching that are also a far cry from the Orthodox perspective. Of course, the overemphasis on the historical “factualness” of Christian truth is also an expression of the deficient view or even outright denial of biblical sacramental understandings. Thank you for this paragraph especially, Fr. Stephen. This ‘participation’ is such a mystery, but it fills me with wonder, hope and gratitude. BTW, there is a lovely article in the recent edition of “Road to Emmaus, Vol. XII, No. 1, Winder 2011 (#44)”. It’s called “The Orthodox Clock and the Map of the World.” The article interviews Juliana Bibas, a PhD student in Soviet History. In this article she explores the Orthodox understanding of time as understood by the early Fathers and represented by maps of the world – time as sphere, surrounded by the eternal. Her work is significantly impacted by Maximos the Confessor. I learned a lot from this article and would highly recommend it to those who are interested. 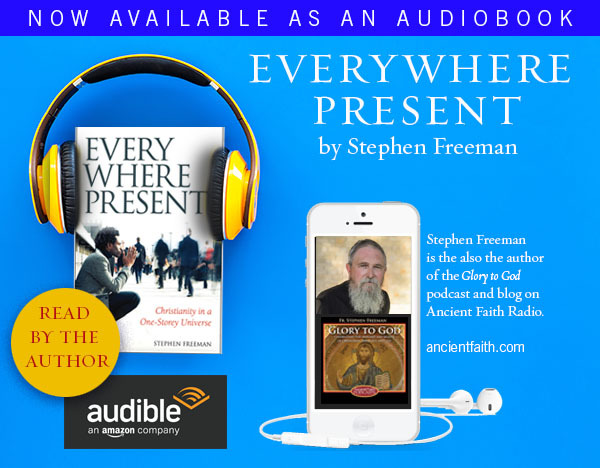 It is also a lovely article to share with those who are experiencing the falling asleep of a loved one because it emphasizes the eternal NOW and the liturgy as a bridge between time and the eternal NOW. Do you ever see Holy Week in the church as overshadowing Pascha just as the celebration of Christmas overshadows the birth of Christ? Just the opposite for me, Prudence. Pascha is actually present within each day of holy week (even good Friday). All of Holy Week seems like a deep commentary on Pascha, that takes us into its mystery. Many Protestants who do not have holy week services, leap into Easter with very little prelude, and reduce it to the least of its meaning. Whereas, in fact, Pascha is the mystery of everything – everything is gathered together in the Lord’s Pascha. Barbara, I would like to read that article. Can you point me to a source for this publication? Thanks. Yes, I know this is true (journey into the mystery). Maybe its me and my wandering soul that gets distracted by the flurry of Holy Week. Thank you, and have a blessed Holy Week and Pascha! This post tangentially touches on the point of what I call “liturgical pretending”. As we end lent and enter into Holy Week I have been thinking about the tendency to “pretend”… I have found that many people attempt to relate to the events of Holy Week as if Christ has not risen – especially Good Friday. It ends up being this big drama that seeks to elicit emotions of lamentation and breast-beating as an attempt to identify with Christ in His death by seeking to be in the same existential place as those who experienced it 2000 years ago. That seems to me to be completely false. We are participants in the eternal sense but we are located on the “other side” of the events historically. We are not being asked to suspend our historical place in that sense are we?? Have you or others you know written on this liturgical tendency to pretend?? Speaking for myself, I have always found great joy in the Lamentations and Holy Saturday Liturgy and have always been taught that they really share in the anticipation of what know, that Christ is Risen. At the same time, there is value of going into the tomb, so to speak, or when existential events take you there of the experience of darkness even though there is always a little light at the end of the tunnel. The Bridegroom Matins make this abundantly clear: “I behold the bridal chamber richly adorned for my savior, but I have no wedding garment to worthily enter. Make radiant the garment of my soul, oh giver of Light and save me.” The even here at the beginning of Holy Week is the Light of the Resurrected Christ, but we have to enter into the darkness of our own souls in contrition and repentance in order to fully partake in that Light. The Orthodox do not believe that we are in a different existential place as those who experienced it 2000 years ago. It is true that psychological manipulation (of onesself or others) would result in a false experience. But to encounter the risen Christ is an expectation of the faith, whether we do so in sacrament or icon, the hymns and theology of the Church. What you have described is a very non-Orthodox approach to liturgical life. Christ is the Alpha and Omega. The One who was crucified and resurrected, is the same Lord whom we now encounter and in Him, there is no “historical” time that is now passed and lost. Forgive me for plugging my book, Everywhere Present, but there are a couple of chapters near the end that have much to do with time, etc. Also Schmemann’s For the Life of the World (is far superior to my work). Which part of what I have described is non-Orthodox, the “manipulation” part or the “historical place” part or both? I have obviously used the word “existential” in the wrong manner. Forgive me. My point is not about past and future in the “flat world” sense. I get the authenticity of being in the same point of reference with everyone else who is being encountered by Christ no matter when in history. I am impacted by the death of Christ and the resurrection of Christ just like them. But, I am not them. Alike and yet inescapably different. I think that is being historically honest while at the same time not being historically bound. My point is about the “pretending” part in which I am somehow told to suspend my relationship with Christ as it now exists for the sake of some perceived benefit. That is pretending. The narrative of my life / our life in Christ is part of my experience. I must bring that to the moment — my memory, my hopes, my mistakes, all of it. What is more, I must bring the “we” as well. Our memory, our hopes, our mistakes, all of it too.That makes me the same as those folks 2000 years ago and different at the same time. This is the website for the journal, “Road to Emmaus”, that I mention in my post. Unfortunately the article I mention is not yet posted on-line. You would have to subscribe to the magazine. This site give some back articles, though, so you can see what the journal is like. I have enjoyed every issue because there are usually only three or four articles and they are all quite in depth. They also do a lot of interviewing. Fr. Thomas, forgive me. I think I understand your question better now. I remember when I was in an Anglican seminary (many decades back) I had a professor who was an old Anglo-Catholic. He had an approach to Holy Week in which the goal was to reach the end of good Friday thinking that Jesus is dead. He wouldn’t allow you to give a hint of resurrection in a pre-Easter Holy Week sermon. Orthodox services of Holy Week are full of references to the resurrection. Thus there’s never the “pretend” problem – but thinking back to the example I gave – that certainly had a lot of “pretend liturgy” about it. Sentimentality is useless in the spiritual life – but is often substituted for it. There is this very strong element of “realized Eschatology” (or something somewhat similar) in Orthodox spirituality and theology. But on the popular level, I’m sure there’s plenty of sentimentality to be found as well. St. Paul said that Christ sacrifice was from before the foundation of the earth. I think that what St. Paul was getting at was that the sacrifice was/is eternal and that the historical event of that sacrifice was the manifestation of that eternal sacrifice in time and space. The eternality of that sacrifice means that it is present here and now and the eucharist, when it is celebrated, is participation in time and space in the eternal sacrifice.